Remember, the guild system will change in the future. Feel free to talk to each other about what you would like to see in a guild system. Cyan has a plan for what it wants the system to be and we hope to show you that plan in the future. Last edited by greydragon on Sat Jan 24, 2009 7:41 pm, edited 2 times in total. Thank you very much for creating the guild section for us. 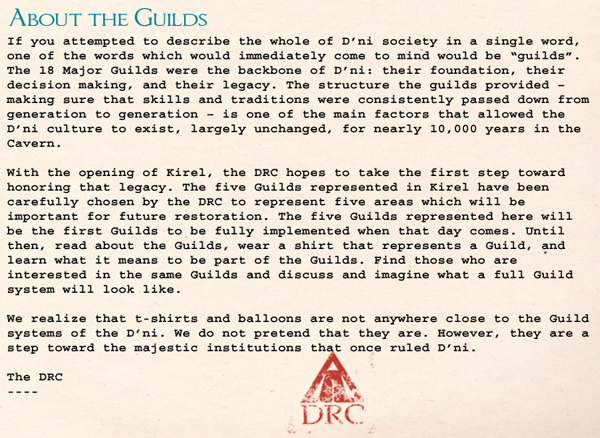 Can you elaborate on how we should proceed to create an official guild? How should we "register" a guild and its members? The Guild of Greeters is a good example of a guild that was created and then later recognized by Cyan as "official." I don't see it being changed very much at all by Cyan to fit the story in the future. Look closely at their structure and formation for ideas. Remember, Cyan needs everyone's help to make the guilds work in the future. As this point, it's mostly still the simple spark of an idea. Last edited by Reverend Vader on Mon Aug 06, 2007 7:24 pm, edited 4 times in total. Let the collaboration and creativity begin! We - a bunch of people from several age creation related groups plus some non affiliated - don't want to see the GoW as a place for politics and struggle, too. We also don't want that some people are grabbing the name without consolidating with others. Thank you for providing a central place to discuss guild matters. Already, this new forum is abuzz with topics. We clearly needed an outlet for our ideas and concerns. If you're willing to entertain a few suggestions, please look over the items below. Appoint moderators for this and the subforums. A natural choice would be Reteltee, of course. The subforums could be moderated by a representative from each guild. Again - thanks for your help, GreyDragon! This is really important to remember. Anything official is Cyan's call. Be careful about investing huge amounts of effort and energy into a Guild structure when it is possible that Cyan may decide it wants something completely different. That way lies the broken ruins of groups like the DRC Liaisons. It might be best to think of this period as an extended brainstorming period. "Be careful about investing huge amounts of effort and energy into a Guild structure when it is possible that Cyan may decide it wants something completely different." But equally: be careful about waiting for Cyan to invest lots of effort before you invest any. I'll probably not notice PMs on this forum. You can contact me via email: "diafero arcor de" (add at and dot to complete the address). The decision was made to make this forum a very general place to talk about the Guilds, and as such, we won't be adding new sub-forums or moderators to this board. Groups are more than welcome, however, to manage themselves (with the understanding that nothing is official yet) on separate websites and forums. Not saying your suggestions are bad, I'm just laying down what decisions were already made regarding this forum's purpose . The Cartographers have had their forum for some time too. Um ... [coff!] Assembly of Guilds. Already done. Explorer-moderated so eventual leaders can moderate their own sub-forums. Private areas also can be had for members-only discussion. Reteltee is already a moderator over there and endorses it. /cheer!!!! What a wonderful new concept to bring into Uru! And... with the release of official age writing tools (hopefully! ), Yeesha will get some SERIOUS competition! Having a forum for guilds here is a good idea. The process of forming a guild is something that will be debated by its members forever. We (Cyan) don’t have the guild systems in place at this time. We (Cyan) aren’t going to say who should be guild masters for each guild. Heck, at this time we aren’t going to control them in any form. It doesn’t mean that you (the community) can’t take it upon) yourself to do so. "Go ahead and plan, and make a Guild of *whatever*, but we'll be making our own system in the future, when we're ready." What assurances do any of us have that any effort put towards building a guild, of any structure, will mean anything when Cyan launches 'official' Guilds? Why are we being asked to do work, when something different will be used by the Cyan in the future? Shouldn't we be *WAITING* to organize, until Cyan shows us what their system is? Or are people putting cart before horse in their enthusiasm for the word GUILD?